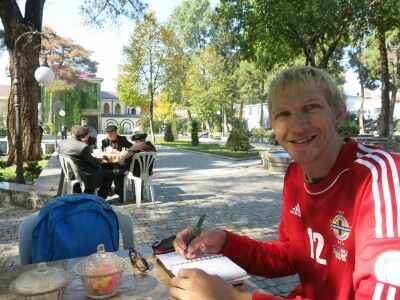 Thirsty Thursdays: Doing a bit of travel writing while waiting for my tea in Seki Square, Azerbaijan. It’s off to Azerbaijan for today’s Thirsty Thursdays and a relaxing sober moment for a change. I haven’t had a lot of time to relax recently, but this was an hour where myself and my girlfriend found time to chill out, in the city of Seki. Drinking hot tea in the October sunshine. Thirsty Thursdays: Loving the tea in Seki Square, Azerbaijan. 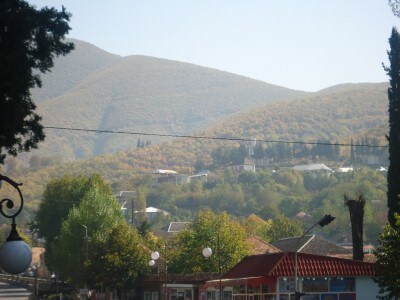 Seki is city surrounded by mountains. It’s a pretty city and somewhere which you should put on your schedule when you go backpacking in Azerbaijan. It’s also near the Georgia border which helps out, as you can use it as a stop off point. For us, we stayed in Seki for 2 nights at the end of our 10 days in Azerbaijan. It’s a perfect place to relax. Nothing moves too fast here. The tea culture and tradition was certainly worth a try. 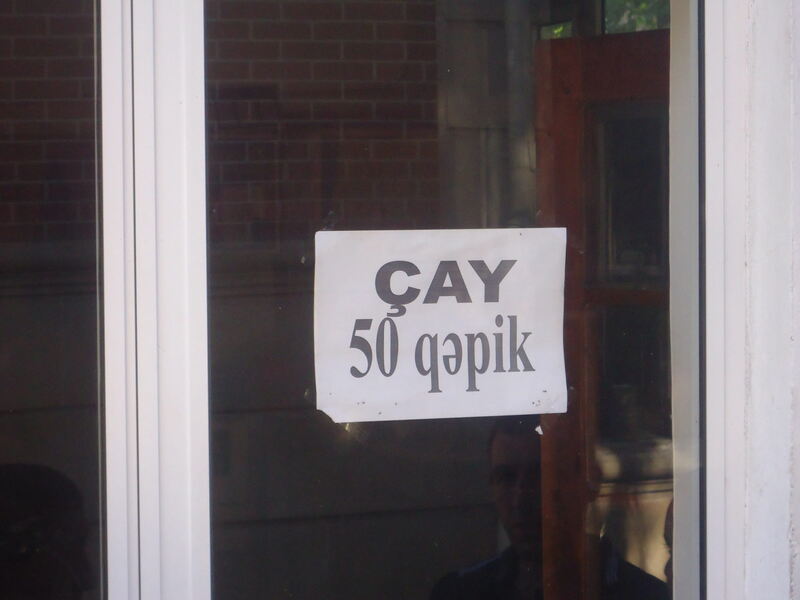 It’s only half a Manat (50 q) for a cup of tea! 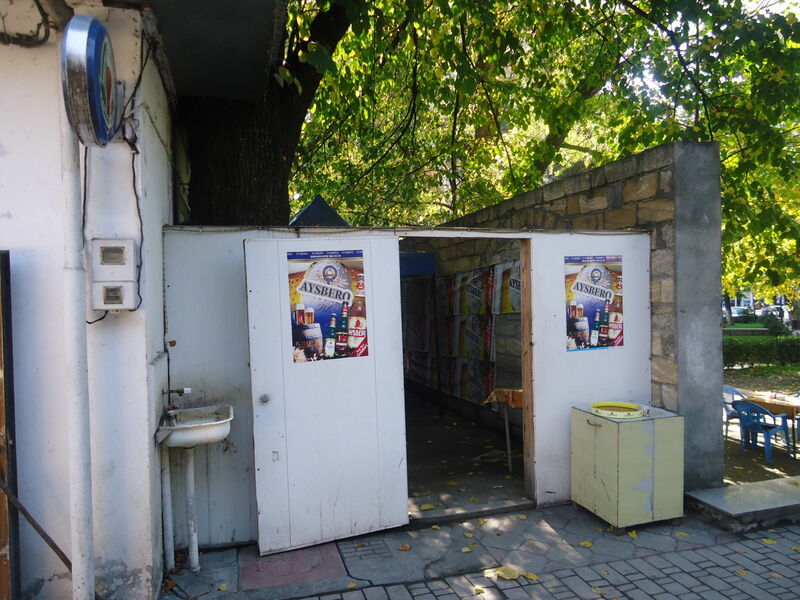 Tourism in Azerbaijan hasn’t really taken off yet. We were the only backpackers in Seki on our visit. You’ll attract lots of looks form the locals, some of them will chat to you and say hello. It’s a very welcoming city, and yes it’s “off the beaten track”. Getting there isn’t as hard as you’d think though. Seki has a bus station which serves most big towns and cities in Azerbaijan. For ease of getting there, we arrived by Marshrutky from the main bus station in Baku. A Marshrutky (mini-bus) cost 6 Manats. 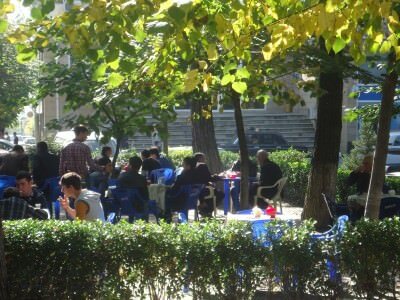 What is there to do in Seki, Azerbaijan? Quite a lot – this is a great relaxing place with a fortress, palace, mountains all around and a quirky courtyard hotel for hostel prices. I’ll be writing about the city itself in another post. Time for tea in the square! 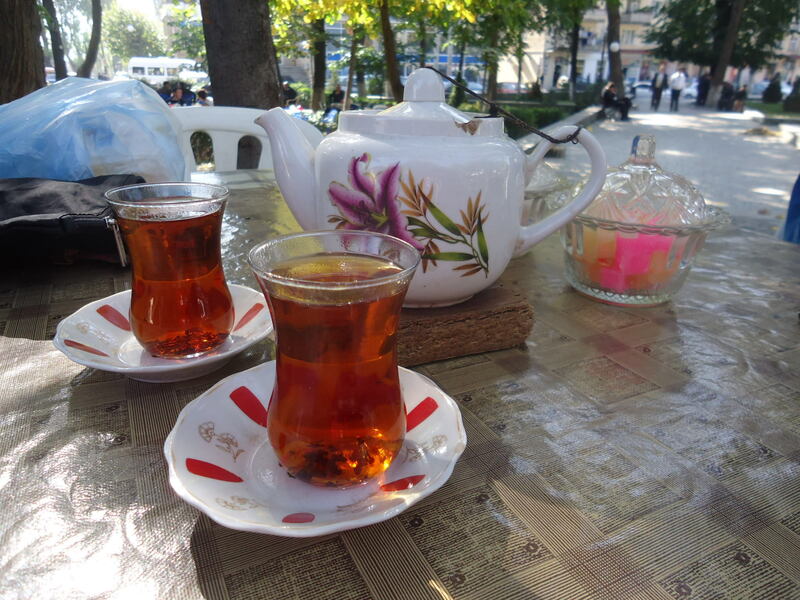 Thirsty Thursdays: Tea in Seki New Town Square, Azerbaijan. It isn’t hard to find your way around Seki. There’s a new town and an old town, with no obvious barrier between them, they merge into one another. The main square sits in an obvious place. It’s off 20 Yanvar Street (20th January Street). You’ll find it! 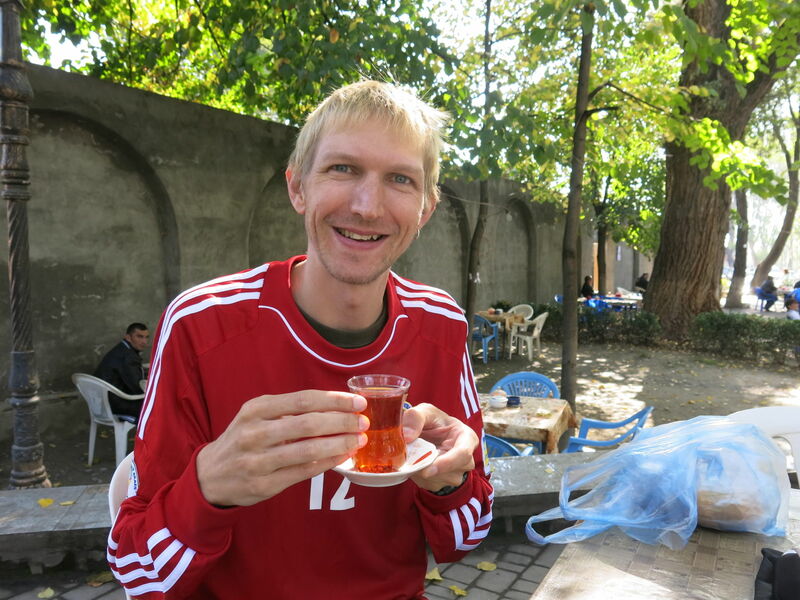 When should you drink tea in Seki Main Square? It’s a daytime thing. We went just before lunchtime. 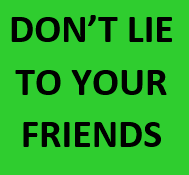 Generally people hang around between 9am to 1pm just sitting there drinking tea to their heart’s content. The tea scene in Seki New Town Square. 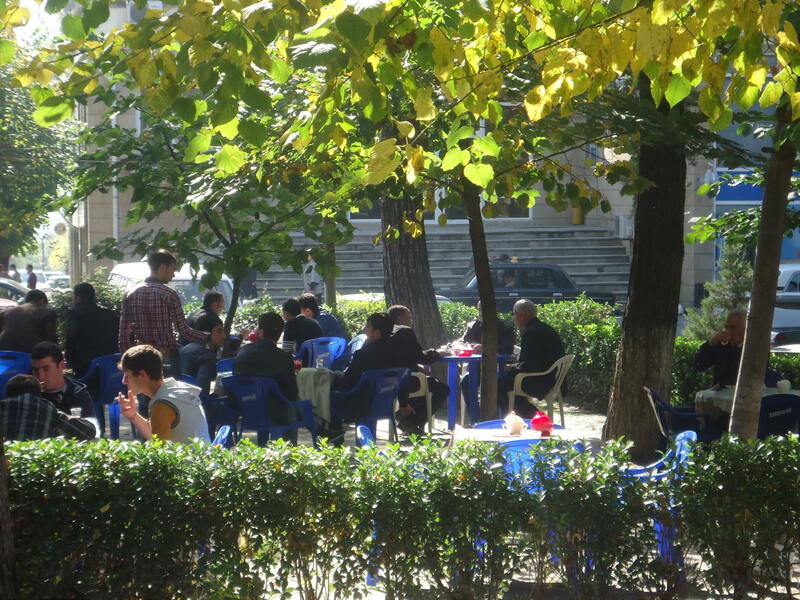 Who drinks tea in Seki Main Square? 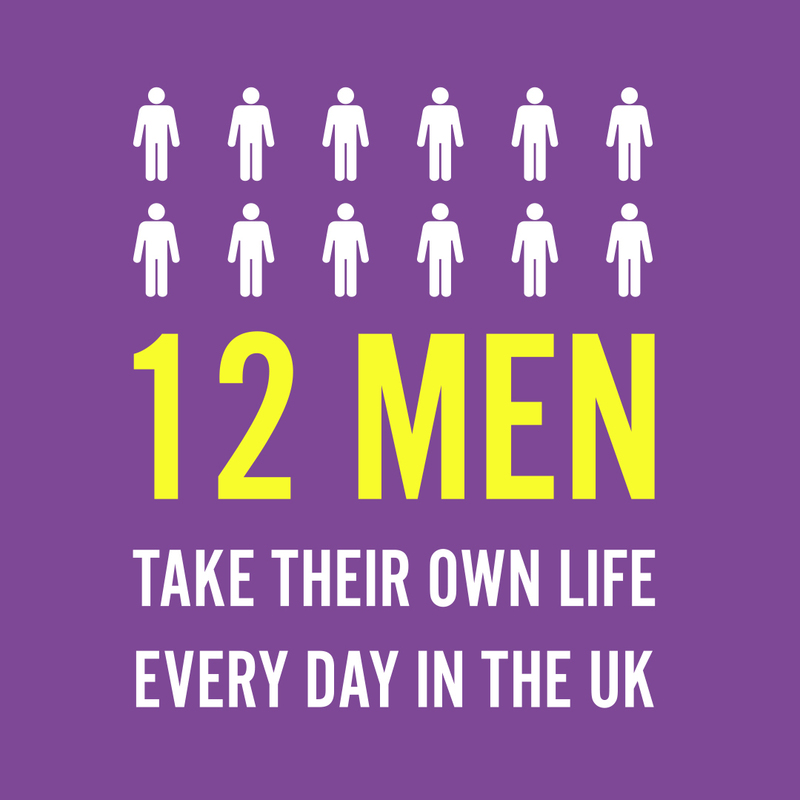 Oddly it’s only men. Yes, Azerbaijan is a Muslim country and it seems this idea for drinking tea in the square in Seki is for the guys only. My girlfriend was with me though and it’s no problem for females to drink here. It’s just that the local Muslim women don’t do it. 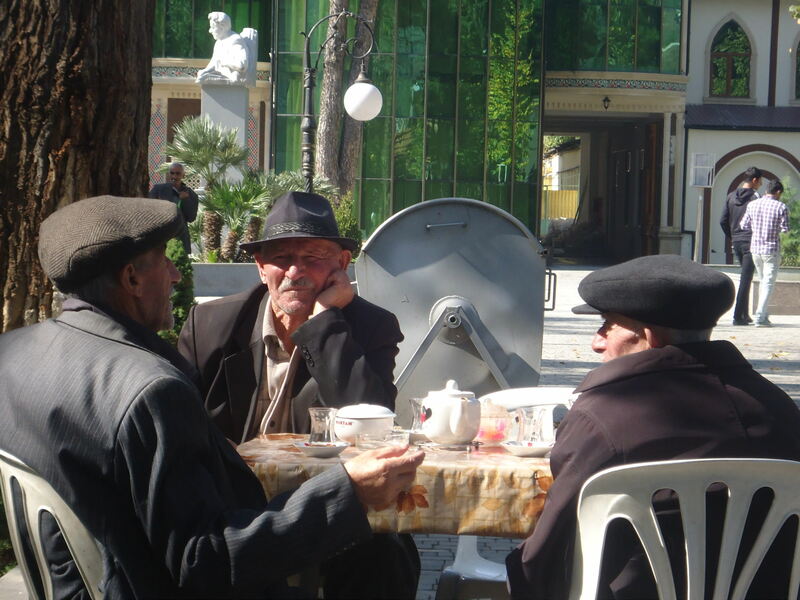 Local gentleman basking in the sun and chatting over a cup of tea in Seki. Just take a seat. There are a load of tables all over the place. Sit down and a guy from the tea shop will come over. Basically they’ll know you’re there to drink tea. They don’t speak English at all, they understand Russian and Azeri only. They’ll bring you one pot to share and two cups (if there are two of you of course). How much does tea cost in Seki Main Square? It’s a flat set rate. 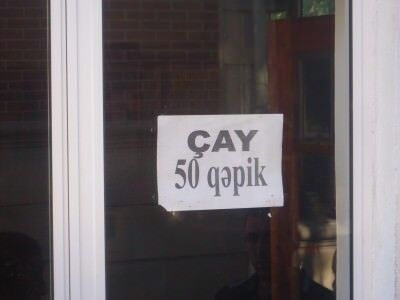 50 q for a cup. That’s half a Manat, so about 50 Euro cents equivalent. 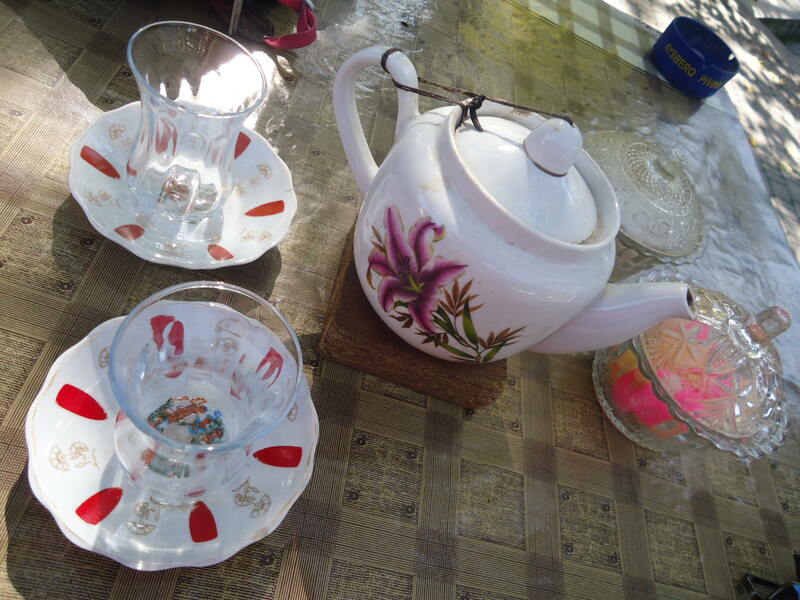 We paid 1 Manat for the pot and 2 cups. There’s a sign up with the price on it. 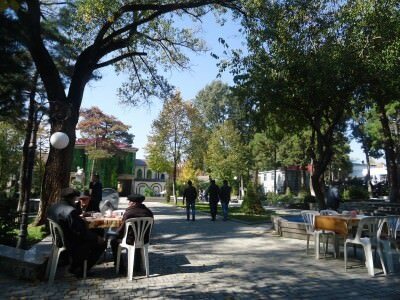 The Main Square in Seki, Azerbaijan. Why should you drink tea in Seki Main Square? Because life is all about relaxing and enjoying a chill out moment when you can. Seki doesn’t move fast, nor does it need to. This is a truly relaxing place to sit, drink tea and watch the world go by. 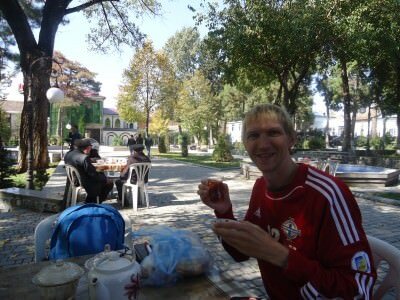 Enjoying the relaxation of a tea in Seki Square. 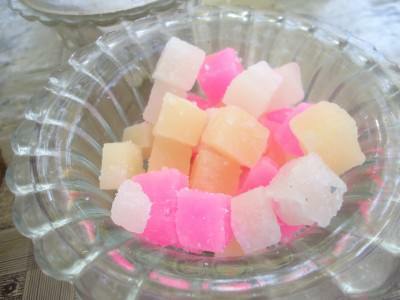 What is the tea in Seki Main Square like? You drink it with sugar if you wish but not with milk. It’s strong, tasty and enjoyable. I loved it. Don’t drink it to quickly. It stays hot enough. Sip it gently and chill out. 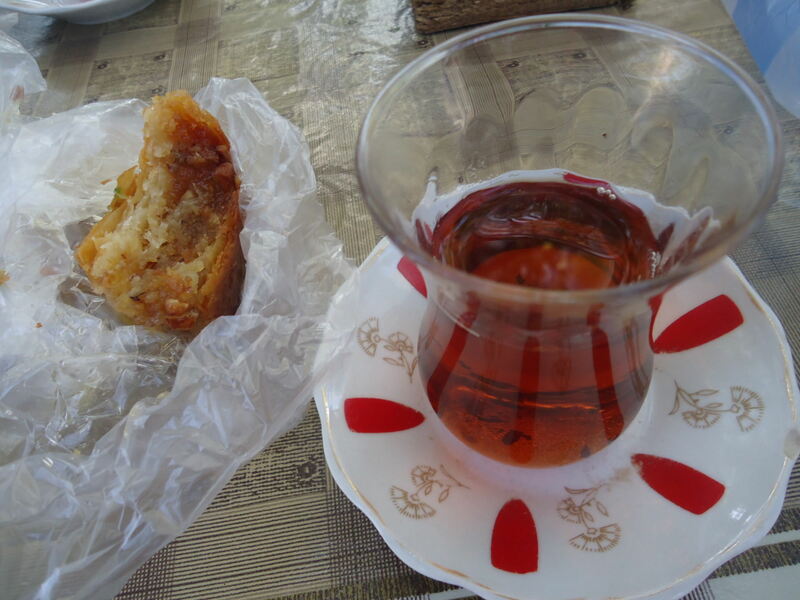 As a final tip, buy some local pastries or cakes from a bakery in town and eat it with your tea. I also tried the Seki Halvasi, a famous sweet dessert famous in Seki only, will cover that in a future episode of Friday’s Featured Food. The tea house in Seki Square. 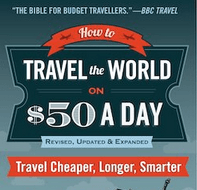 Thirsty Thursdays is an ongoing regular feature on Don’t Stop Living – a lifestyle of travel. If you have a bar, pub, drink, restaurant, brand or idea that you would like featured on Thirsty Thursdays, please get in touch via my contacts page or my advertising page. I’d love to hear from you, and I’d also love a free cup of tea or a beer! This entry was posted in Azerbaijan, Central Asia/Middle East, Daily Features, Destinations, Seki, Thirsty Thursdays. Bookmark the permalink. Looks just like my kind of place – relaxing with a pot of tea. I’ll add this to my ever-growing list of places to visit. Where are you headed to next?